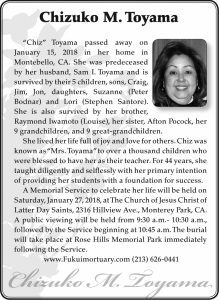 “Chiz” Toyama passed away on January 15, 2018 in her home in Montebello, CA. She was predeceased by her husband, Sam I. Toyama and is survived by their 5 children, sons, Craig, Jim, Jon, daughters, Suzanne (Peter Bodnar) and Lori (Stephen Santore). She is also survived by her brother, Raymond Iwamoto (Louise), her sister, Afton Pocock, her 9 grandchildren, and 9 great-grandchildren. She lived her life full of joy and love for others. Chiz was known as “Mrs. Toyama” to over a thousand children who were blessed to have her as their teacher. For 44 years, she taught diligently and selflessly with her primary intention of providing her students with a foundation for success. A Memorial Service to celebrate her life will be held on Saturday, January 27, 2018, at The Church of Jesus Christ of Latter Day Saints, 2316 Hillview Ave., Monterey Park, CA. A public viewing will be held from 9:30 a.m.- 10:30 a.m., followed by the Service beginning at 10:45 a.m. The burial will take place at Rose Hills Memorial Park immediately following the Service.